Preheat the oven to 180C/350F/Gas Mark 4. Place the chicken breasts on a board and using a meat hammer bash them out a little. Make a slit in the chicken breasts where you will put the garlic butter. Mix the crushed garlic clove with the butter and a little of the fresh parsley in a bowl until well combined. 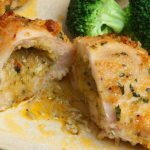 Place a spoonful of the garlic butter into the slit you have made in each chicken breast. Stick two cocktail sticks through each breast to hold the slit closed. On a plate mix the ground almonds with some smoked paprika, ground cumin, a little fresh parsley and salt and pepper. Crack the egg into a bowl and lightly beat. Dip the chicken breasts first into the egg and then roll in the ground almond mixture to get a good coating on both sides. Place the kievs onto a plate. Heat the cooking fat in a frying pan and then fry the kievs for 3-4 minutes per side to get a nice crispy coating. 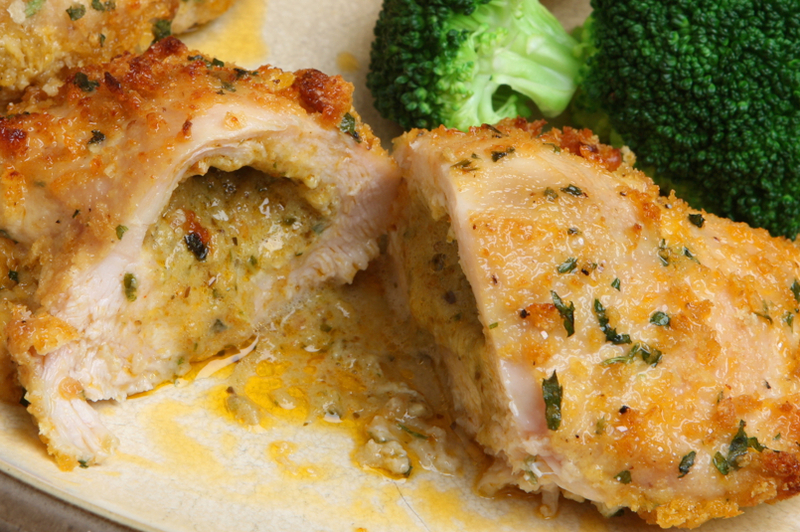 Place the kievs into an ovenproof dish and bake for 15 minutes or until the chicken is cooked through. Remove the cocktail sticks before serving.